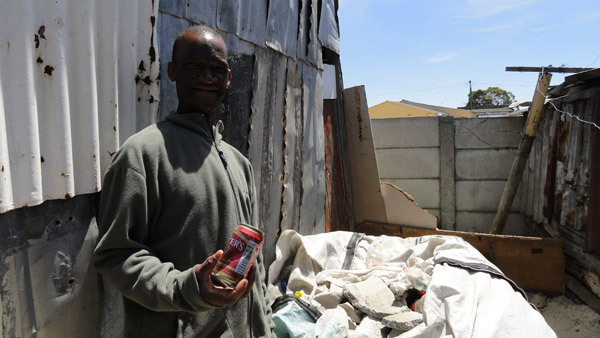 The Solid Waste Network (SWN) is an Informal Settlement Network (ISN) initiative in Cape Town that provides access to markets for informal waste pickers. It employs five full time staff, and services more than 350 pickers throughout the Cape Town metropolitan area. 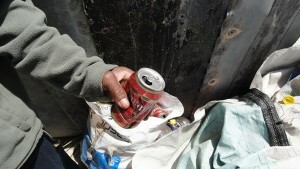 The goal of the Cape Town recycling social enterprise model is to upscale to a national footprint, and has the real potential to achieve sustained impact as a livelihood programme. Video courtesy of barefoot workshops. All rights reserved. In 2005, ISN established links with recycling groups in Nairobi and Cairo through the SDI network and attended horizontal learning exchanges between the 3 cities. Back in South Africa, the first phase implementation focused mainly on building the network. By October 2005, the network sold its first plastic, cardboard and glass recyclables to an intermediary to the recycling industry. Recycling must be done at scale to make it financially viable, and adequate transport was required to achieve scale. Moreover, cutting out the intermediary and gaining direct access to the end market meant that pickers could earn more. In January 2006 the programme acquired a truck and a trailer with a net capacity of 3-ton load. This made it possible to expand and support more community groups. The programme has since expanded to support 30 groups in the Cape Metropolitan region, serving more than 350 pickers. CORC provided reliable transport, access to markets, learning experiences, and storage facilities. The network maintains a working relationship with the City of Cape Town’s Solid Waste Department, and works towards waste minimisation and greening of informal settlements. Presently the City experiences crises in solid waste management and reaching critical levels in its existing landfill sites. The growth of the SWN continues to service more organised ISN groups, enabling them to take control of the programme, while CORC subsidies the transport and provide oversight. Despite the emphasis on finding new solutions to waste management, little institutional and organisational capacity has been developed to take informal waste management to scale. Research and experience has suggested that it can be highly counterproductive to establish new formal waste management and recycling systems without recognising the role of the informal sector. Due to this marginalisation, and no pro-poor framework to encourage job creation and livelihood opportunities in solid waste management and recycling, the poor often do not benefit from this core municipal function. The SWN has two components: 1.) the SWN as a community-based network of communities of informal waste pickers, and 2.) the support system comprising of the collection and management team. The SWMN promotes as socio-institutional approach to integrating informal waste pickers in the formal recycling industry. By creating organisational capacity to advance pro-poor and inclusive measures to integrating the poor, the SWN enables market mechanisms to work for the poor. The collection team responds to the demands of the network, i.e. when someone is in need of cash, they make amendments to their collection plan. The SWN meets monthly as a learning platform on recycling industry and policy developments, as well as operational aspects to develop the income component. A community waste collection and sorting point is in convenient proximity for waste pickers, and acts as a learning process to replicate such Buy-in model in other parts of the city. In Cape Town, the SWN has developed a working relationship with a number of industries: Paper (Nampak and Mondi); Plastic (Extrupek, New Heights and Proplus) and Glass (SAB-Miller, Distell, Mega Metals, Consol and Macro). The SWN is recognized as a stakeholder in the industry, and has national working relationships with The Glass Recycling Company (TGRC) and the Plastic Federation (also known as PETCO). The focus of our programme has been women, who have come together in community savings groups to support each other. The recycling groups work in teams of 3 to 10 members. 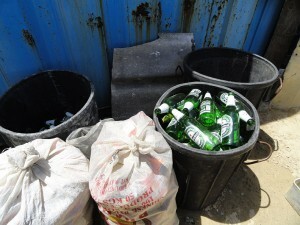 The majority recycling membership are involved in voluntary community upliftment initiatives, i.e. food security for vulnerable people, orphans, health programmers, gender base violence and HIV/Aids. Organized pickers’ collectives will decrease the vulnerability of these communities, and make them more visible. This will create a platform for addressing basic health issues, education and child care needs of children, alcohol / drug abuse, shelter needs, etc. Today, the SWN continues to operate on a meagre budget, and has limitations in its capacity to reach more pickers. However, in terms of social development, the SWN benchmark is unmatched. The tonnage capacity of groups determines their monthly income, which ranges from R800 – R2,000 pm per individual. The average tonnage capacity for glass and returnable bottles reaches 40 – 60 tons per month depending on supply of Network Pickers. Income is thus dependent on commitment, access to recyclables, storage capacity, and market prices which vary dependent on supply and demand. In terms of financial sustainability, the network covers more than 60% of its operational budget through revenue generated in sales. SWN has also launched a research agenda into value-added products such as note pads and gift cards, drinking glasses, firestarters / briquettes from recycled paper, bags, and many more. The production of new marketable recyclable products will increase the sustainability of the SWN Programme. Scaling up the SWN model is essential if we are to realize the goal of affecting policy change at City level. Moreover, the SWN has set its sights on expanding its model through ISN in the major cities of Gauteng, Eastern Cape and Kwa-Zulu Natal. We have facilitated national learning exchanges from these regions to the Cape Town Recycling Network. In all 3 Cities Pickers have commenced with recycling pilot initiatives requiring resource support through capital injection. The challenge for SWN is the national scale up of our community-based recycling model as a social enterprise, and reducing the carbon footprint in our ever growing metropolis. Our expansion plans are dependent on pending capital injection.